Over the summer, a new smart classroom was installed in Classroom 4 on the seminary campus. Our smart classroom is made up of an interactive television, auto-tracking camera, and smart speaker/microphone array. The new equipment allows the seminary to record and stream class sessions if desired. In the future, interactive classes could take place over technology like Zoom, where students in other parts of the world will be able to ask questions while watching a lecture, just as if they were in the classroom. Additionally, the interactive TV allows videos and other visual-intensive items to be displayed and magnified more clearly. 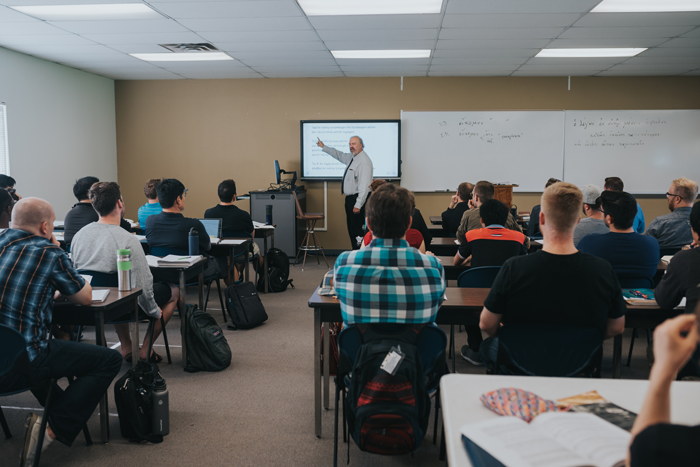 The seminary began pursuing a smart classroom in November 2017, resulting in a planned summer project for one classroom to see how the technology would work. The installation began on July 11 and all technical tasks were completed by September 17. It is now fully operational and available for professors to use. We are grateful for this valuable addition to our campus and the ways it will continue to enrich our students’ education and expand the seminary’s reach.